What is a DALI Device Type? DALI Device Type refers to classes of operating devices, for example ballasts for fluorescent tubes or drivers for LEDs. For each type the standard has been adjusted to include type-specific functions and commands. What are the minimum requirements for a DALI system? The basic conditions of a DALI circuit are the cable length (300m with 1.5mm2 cable cross-section), the number of individual addresses (64) and the maximum power requirement of a DALI circuit (250mA). 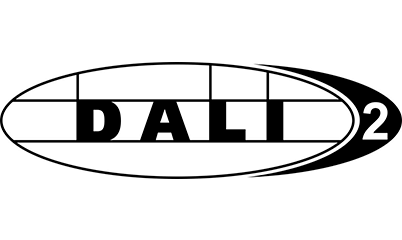 The simplest DALI system consists of a DALI bus supply, a DALI operating device for example an LED driver and a DALI control unit (DALI MC+, DALI ROT, ect.). If you want to control several operating devices individually, the devices have to be addressed during the installation setup, which can be done with DALI USB and the PC Software DALI Cockpit. What are the advantages of DALI compared to 0-10V control technology? Each DALI device can be assigned an address and thus individually controlled. Groups of operating devices can be created and controlled together via group commands without the need for any changes to the wiring. Due to the software configuration of the entire system, the installation costs are significantly lower. Due to the digital signal transmission, voltage drops on the control lines are irrelevant and all operating devices reliably receive the same setpoint. In addition, the status of each operating device can be queried and various settings can be stored in the operating devices. A DALI system thus offers better quality and more reliability and easier maintenance at lower costs. Is it also possible to control more than 64 control gears via DALI? There are 64 DALI short addresses per DALI circuit. With a DALI Expander, the number of operating devices can be increased. 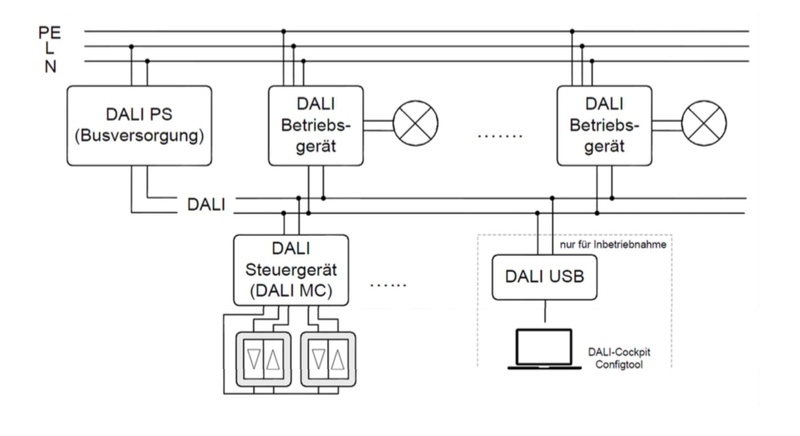 Up to 64 additional operating devices can be connected to the expander output, which are controlled together via the DALI address of the expander. So theoretically 64 times 64 bulbs could be controlled. The DALI Expander3 or the wDALIGroupController offer similar possibilities. Can a control gear belong to several groups? If so, which group has the highest priority? Each control gear can be added to each of the 16 groups. All groups are equal in their priority. The last valid command sent to the control gear directly or to the group has the highest priority. What are “single address”, “group address” and “broadcast”? to broadcast, which are commands sent to all the devices on the DALI line. What does “scene” refer to? A scene is understood as a specific lighting scenario. Each DALI operating device can store up to 16 settings as scenes. These scenes can be recalled by control devices (for example DALI Touchpanel). Thus with the use of a single command the light scenario can be changed to another -> up to 64 luminaries change their state at the same time. What is the difference between “groups” and “scenes”? A scene defines a specific state for each operating device (dimming value, color temperature, color depending on device type). A group is a summary of several operating devices that are controlled together via the group address. A control gear can store 16 scenes and can belong to 16 groups. How are scenes and groups numbered? The 16 groups and 16 scenes are numbered according to the DALI standard, which starts at 0 and goes to 15. Does every operating device on the DALI bus require an address? All operating devices that are to be individually controlled or configured require a DALI address. If operating devices are not addressed, they can only be controlled via broadcast commands or group commands, if the devices have been assigned a group in advance. What is the difference between “fade rate” and “fade time”? Both parameters are used for fading (= the temporal change of the light level). “Fade time” refers to the time needed to go from the current brightness value to the new target value. Thus, for example, it is applied to direct brightness presets (DAP) or scene calls (GOTO SCENE1). “Fade rate” defines the dimming speed of the relative dimming commands UP and DOWN. After a relative dimming command, the light will be dimmed for 200ms at the defined dimming speed. Can operating devices which do not have a DALI control input also be integrated in a DALI system? Yes, by using interface converters such as DALI 0-10V, DALI DSI, DALI RS232, DALI RS485, DALI DMX, devices can be connected using other control technologies. It is also possible to switch loads using DALI-controlled relay modules (for example: DALI RM8 / RM16) or to integrate loads with phase-control using DALI PD modules. Can several rooms be combined in one DALI circuit? Yes. The basic conditions of a DALI circuit are the cable length (300m with 1.5mm2 cable cross-section), the number of individual addresses (64) and the maximum power requirement of a DALI circuit (250mA). In compliance with these conditions, the DALI circuit can be distributed over several rooms. Can a DALI circuit be controlled with commercially available switches or buttons? Yes, this is possible using a “push-button coupler”: DALI MC+, DALI GC, DALI SC. These devices generate corresponding DALI commands from the buttons switching actions. What is needed for a DALI system Set-up? You will either need a suitable control unit (eg: DALI 7″Display) or commissioning tools (eg: DALI Cockpit Software + DALI USB Interface). How can an address be assigned to a DALI device? A distinction is made between addressing with physical selection (manual selection of operating devices, this method is only supported by very few devices) and random address allocation, the usual method. If you want to switch and dim your system only with broadcast commands, addressing won’t be necessary. However, if you would like to use all the advantages of DALI (flexibility, groups, scenes, operating parameters, etc. ), you will have to address the devices during the installation Set-up. Can a normal DC power supply be used as DALI bus supply? No. DALI bus supplies must meet special requirements in order to enable the DALI line communication. A special dynamic current limitation in combination with a nearly capacity-free output makes this possible. The patented DALI bus supplies from Lunatone offer safe communication thanks to their minimal interference voltages. What happens if the bus supply fails? This condition is defined in the DALI standard, it is called SYSTEM FAILURE. In this case, the operating devices can no longer be controlled via the bus. The behaviour of the operating devices (usually the brightness value) can be configured in advance. Can a second bus supply be connected if the bus supply is too small? The max. power requirement of a DALI system may not exceed 250mA. However, by using a DALI Repeater / DALI Repeater PS, a DALI system can be divided into two galvanically isolated circuits without restricting the flow of information. The maximum number of addresses in the bus system is limited to 64, but both circuits can be supplied with 250mA each, so in total 500mA are available for the supply of DALI devices. The DALI Repeater works bidirectionally and is suitable for single as well as multi-master systems. What happens if mains voltage reaches the DALI bus due to a wiring error? Since this is a reoccurring issue, Lunatone has equipped all devices with mains-proof DALI inputs, to prevent that devices on the bus are destroyed by unintentional wiring errors. How can a RGB color control be realised with DALI? In a DALI system, there are basically two ways to implement RGB color control. Option 1 DT8: These are special devices with Device Type 8 extension, which send the complete color information to a single address or group by means of an extended instruction set. Option 2 DT6 : The color information can also be mixed via three individual DALI addresses, three DALI LED drivers and three control units. What advantages does the use of Device Type 8 (DT8) operating devices offer over color control with one address per channel? The advantage of DT8 operating devices is that only one DALI address is needed to control color and brightness independently. Since many higher-level bus systems, such as KNX does not include these color commands in its instruction set, Lunatone offers special color control dimmers (Colour&Dim). What is needed to control a DALI circuit via KNX? In principle, this requires a KNX DALI Gateway. Please note that these gateways often only support a simplified DALI command set (depending on the manufacturer) and therefore not all functions are possible. Please also note that some KNX gateways do not even address certain operating devices, although they could theoretically be operated with the standard command set. Controller such as DALI Sensor are partially not supported by the KNX gateways. How can a DALI color control via KNX be realised? Lunatone offers DALI 3/4 channel LED drivers with an advanced mode “Color & Dim”, in this mode 2 DALI addresses are used: one DALI address for switching and dimming, and the second DALI address for color selection (using the Light Level with a resolution from 255 steps). This way DALI color control can be realises easily via KNX. Each color could be controlled separately via its own address. 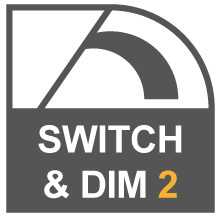 What is the difference between Switch & Dim and Switch & Dim2? Switch & Dim is designed for a single switch input to enable switching and dimming. Switch & Dim2 is used for two buttons/switch inputs to enable switching, dimming, color temperature or color control. Can you also set the "power on level" with Switchdim? Yes, several DALI parameters can be set via DALI and the device will work the same way when used in Switchdim mode. How can I switch the LED drivers between the modes Switchdim and DALI? This is done automatically. When using a DALI bus supply (16V), the device automatically switches to DALI, when using mains voltage at the input Switchdim is activated. How can a possible asynchronism in Switchdim mode be restored? Press the dimming button for >15 sec then all devices will be set to the same value. Can loads be switched directly with Lunatone relay modules? The DALI RM8 is designed for direct switching of loads up to 2kW with inrush currents up to 80A. The DALI RM16 contains an inrush current limitation and can be used with very high inrush currents up to more than 200A. Which phase dimmer do I have to use? There are Leading edge phase cut dimmers and Trailing edge phase cut dimmers, depending on the load the right type is to be selected. Leading edge phase cut dimmers are not suitable for capacitive loads. Trailing edge phase cut dimmers are not suitable for inductive loads. The lamp manufacturer usually specifies Leading edge or Trailing edge, the appropriate type should be installed in any case. Since it is a reoccurring issue that the type is unknown, Lunatone has developed a universal dimmer (U at the end of the article number). The dimmer detects the load and automatically selects the correct dimming method. What is the difference between MC, MC + and MC + Wago? DALI MC + has all the functions of the DALI MC (discontinued model). DALI MC + Wago has been specially adapted for Wago products. What is the difference between the types of 0-10V signal converters offered by Lunatone? Which type is most suitable depends on the application and the 0-10V / PWM operating devices used. How many 0-10V devices can be controlled? Depending on the signal converter used, the maximum analog current is 1 or 2mA. Depending on the specification of the 1-10V dimmers used, this can be 5 – 10 or 10 – 20 devices. In addition, Lunatone also offers a version up to 100mA PWM signal. What is the advantage of a PWM signal over a 0-10V analogue signal? PWM allows a interference-proof digital signal transmission. However, a corresponding device must be used that supports PWM at the 0-10V input. The MeanWell LED power supplies makes this possible. What does DALI Device Type 5 (DT5) stand for and what advantages does it have? DT5 indicates the DALI specification for DC signal converters (IEC62386-206). Various new features are available, such as the selection of dimming characteristics (logarithmic / linear) and output voltage range (0-10V / 1-10V) and adjustment of the physical min level. For which applications is the 0-10V to DALI signal converter suitable? What is the difference between the 0-10V offered by Lunatone and the Dali types? How many devices can be connected to a DALI Expander? Can DALI operating devices connected to the output of the DALI Expander be individually controlled? Commands sent to DALI Expander / DALI Expander 3 are broadcasted to all operating devices connected to the output of the Expander. Individual control of the operating devices connected to the output is not possible. However, with the help of a separate control unit in the output circuit of the expander an individual control can be realised. Can the DALI Expander also be used for DT8 (Tunable White or RGB)? Yes, the DALI Expander / DALI Expander 3 behaves like a DALI operating device without being specifically displayed or representing a DALI Device Type. The corresponding commands are nevertheless forwarded to the output. With the DALI Cockpit’s scene configurator scenes can be programmed. What's the difference between DALI Expander and DALI Repeater? DALI Repeater / DALI Repeater PS is used to extend the DALI circuit in regards to cable length and available power. DALI Repeater provides a galvanic isolation between two DALI lines without restricting the communication flow. Each of the galvanically isolated sides must be supplied with up to 250mA output current, which gives an overall of 500mA to supply the DALI devices. The DALI Repeater allows an expansion of the DALI line from the usual 300m to 600m. Communication via the DALI Repeater is bidirectional. The maximum number of DALI addresses in the bus system remains 64. The DALI Expander / DALI Expander 3, also represents a galvanic bus separation, but it receives its own DALI address, all devices connected to its output are controlled with this address. With the DALI Expander addressed DALI circuits can be combined and controlled via broadcast. Can the DALI Combi Sensor also be used for measurement purposes only? Yes, the control can be disabled and only the presence, light intensity and temperature readings can be polled using special commands or alternatively read out after explicitly assigning a default DALI address. Can several DALI CS be operated on the same DALI line? Yes, the motion detectors synchronise with each other when used to control the same effective range. This means that the light is maintained until none of the synchronised motion detectors detects movement. This is needed, for example in corridors but also in large rooms. How many DALI CS can be used in a DALI circuit? That depends on the application. When using motion detection and constant light control, no more than 16 sensors should be used. Without light control, more than 16 sensors can be installed on one line. Please keep in mind that the power supply of the the DALI line is limited. If 150mA are exceeded, the bus should be split into two parts with a DALI Repeater and both parts should have their own DALI bus supply. Are DT8 devices required for color control with the DALI Touchpanel? No, the color control layout is based on scenes and can therefore be used for the color control of a DT8 devices as well as the control of several individual addresses (one address per color channel). How can I adapt the existing layouts to my wishes? Can I customise or extend the existing layouts? Is the time still correct after a power outage? Yes, DALI CDC / DALI RTC contains a quartz and a battery to guarantee that the time is saved. How must the DALI RS232 SCI be supplied? The bidirectional DALI RS232 SCI must be supplied by both the DALI bus and the RS232 side. For details, please refer to the datasheet. Which functions does the DALI RS232 SCI support? The DALI RS232 SCI supports bidirectional data transfer, standard DALI communication (DALI V1.0) as well as various proprietary protocol extensions and a function for monitoring the data transfer on the bus (monitoring). How does the control of multiple wDALI RM8 modules work? The transmitter of the wDALI RM8 package represents a DALI bus device with a DALI address. For a separate control of multiple wDALI RM8 receivers, you will need one transmitter each. However, it is possible to couple several wDALI RM8s to one transmitter and control them together via the same DALI address. (If several wDALI RM8 receivers are to be coupled to one transmitter, then please indicate this in the order, this has to be preset in the factory). Which devices can be configured with the DALI Cockpit? In addition to Lunatone control devices, the DALI Cockpit also supports DALI operating devices. Device can be addressed and DALI parameters can be set. Which parameters can be set for DALI operating device? Basically, all parameters can be set with the cockpit. Group membership, Scene values as well as the settings for MINLEVEL, MAXLEVEL, SYSTEM FAILURE LEVEL, POWER ON LEVEL, FADETIME and FADERATE. Depending on the device type of the device, further values can be set. What is the "Activation key" and where can I get it? The Activation Key is required for a firmware update of Lunatone components. Lunatone will provide the corresponding code and information, should an update be necessary. How do I get the latest version of DALI Cockpit? The DALI cockpit software regularly checks if a new software version is available, you just have to be connected to the internet. As soon as a new version is available, the color of the “update symbol” (arrow circle) changes. Warning: Validity period of cockpit version expires or has already expired? Please install the latest DALI Cockpit version to make sure it supports the latest components and features. If this situation occurs when you are not connected to the internet, you will be able to restart the software 10 more times to complete your work.